Perhaps I shouldn’t really call this an April Fool’s prank, because it is more anonymously weird instead of delivering a punchline. On the other hand, I can’t really claim this to be a Good Samaritan gesture since really I just have OCD issues, and the state of this bike had been annoying me for like six months. To be honest, the calendar date was merely coincidence. 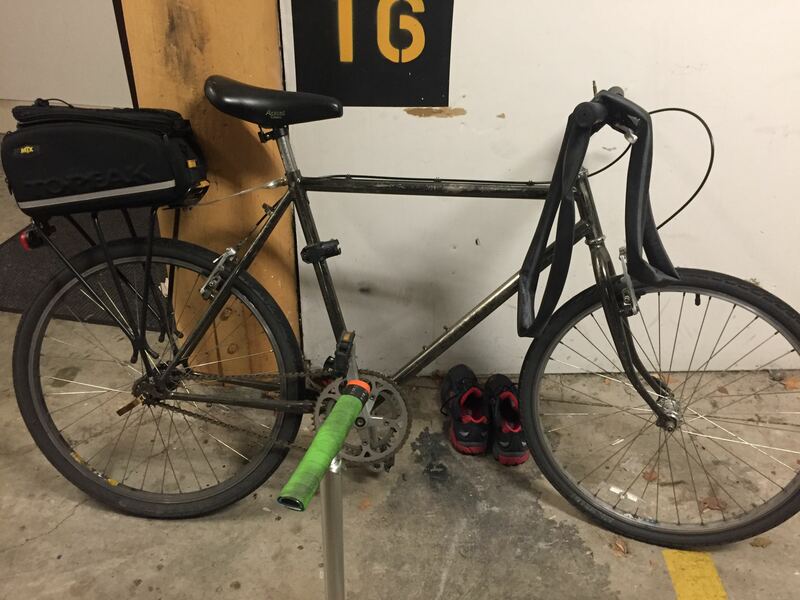 In the basement parking lot of my apartment building, a bike sat unlocked for the better part of half a year with a flat rear tyre. The bike is a ’90s budget mtb that had been stripped down to a single speed. The bike had just enough non-stock parts (like a Surly SS hub) to indicate that someone had gone to some effort to customize the bike, but the neglect and layer of dust showed that no one had cared about the bike for a long time. I think it belongs to one of the on-site managers, but I’m not sure. 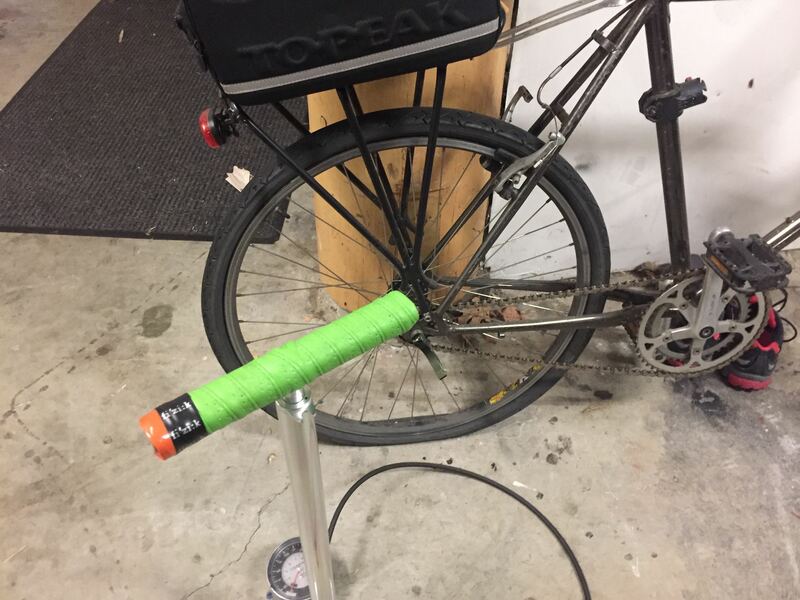 Late last Friday night I finally brought down my pump, a tyre lever, and a 26″ inner tube (leftover tube inventory from closing Elliott Bay Bicycles 2-1/2 years ago). I quickly replaced the tube, but much to my chagrin the inflated tube bulged from a 1.5inch slash in the sidewall. I stomped upstairs to cut a swatch of mylar film from 15-lb rice bag (the bloody expensive brand that ships with nitrogen flushed bags), jammed it between the split casing and tube, and finished the job before any witnesses passed. I decided it wouldn’t be fun if no one noticed, so I left the old inner tube hanging from the handlebar. The next day the bike was gone. Was it the owner who moved it? Fully inflated rear tyre. The next day the bike was gone…but the shoes are still there even now?